Duration: Approximately 5 hours 15 minutes of actual walking – but there is plenty to see on this route so allow for a very full day. Difficulty: Moderate. 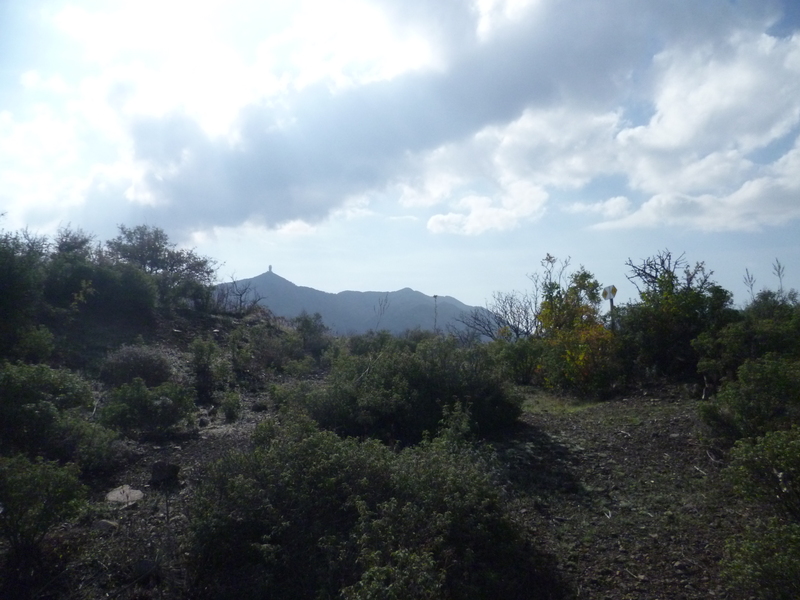 Some occasional steep climbs and descents interspersed with gentle trail and road walking. A walk through some traditional villages, a visit to a Monastery and a chance to see an important EOKA monument and hideout – all in the beautiful Machairas area. Park at Fikardou, near the church. Fikardou has been designated as a UNESCO heritage village – there are some very picturesque ottoman style buildings in this tiny village nestling in the hillside. Also a restaurant. It’s on the tourist route so expect the occasional tour bus, although whenever we have been there it has been very quiet indeed. If you stand with your back to the church looking away from the village along the E916 to Gourri you will see a track leading upwards from the left hand side of the road. 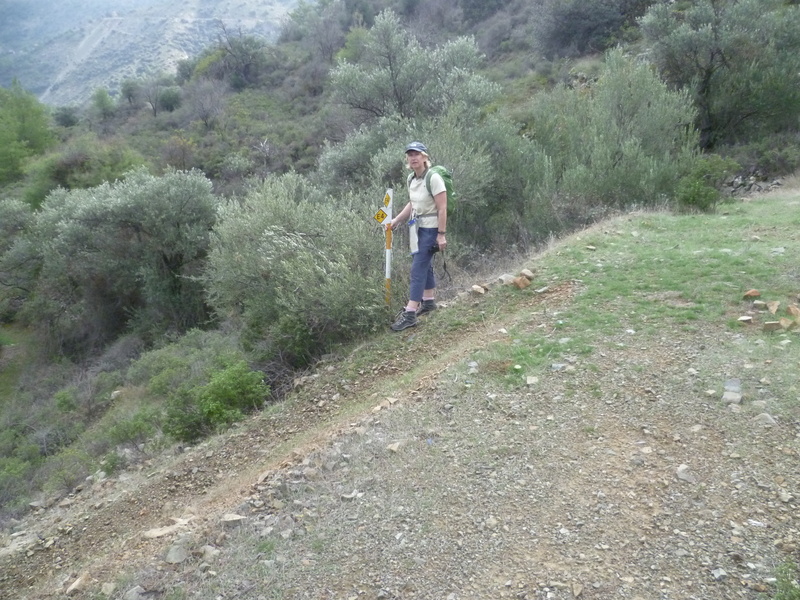 This is your starting point and is a section of the E4 long distance walking route. There is an E4 sign at the point where the path leaves the road. Start walking up this track. After 4 minutes you will reach a junction – take the right hand fork (still signposted as E4 at this point so there should be no problem following the path) and continue uphill. 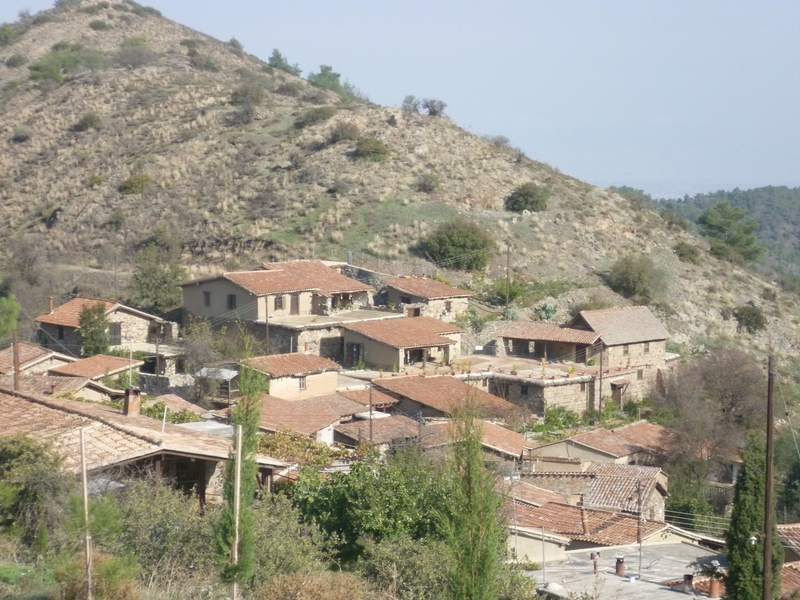 As you walk along the track notice the views towards Nicosia to your left and look back at the Fikardou rooftops. The earth track very briefly becomes a concrete road – keep following the E4 trail until, at 14 minutes, you reach a footpath to the right, again signposted E4. Take this path as it leads up the hill toward some pine trees. Keep gently climbing upwards and at 25 minutes you will see the golf ball radar station at the top of Machairas in the distance. 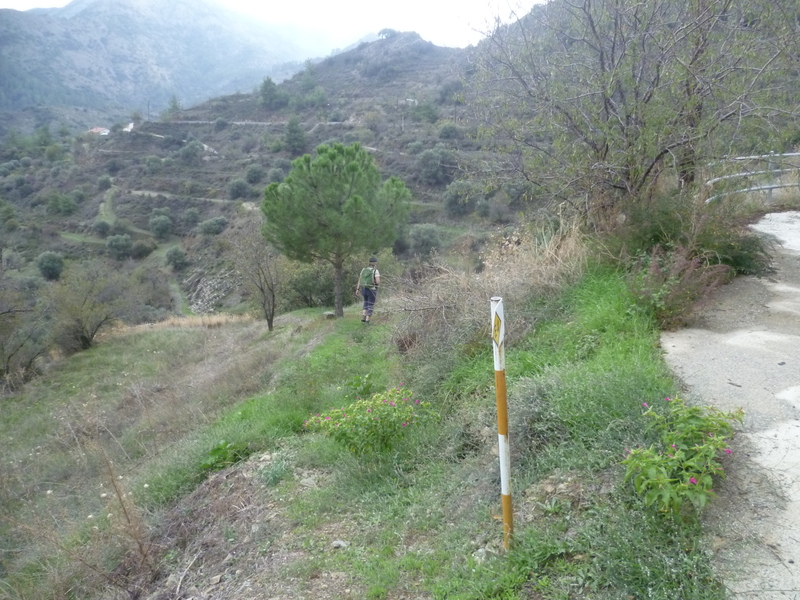 The path now starts to descend down into the valley towards Lazanias and, as it does so, you will soon have your first glimpse of Machairas Monastery at the head of the valley. After 40 minutes you will almost reach the asphalted village road below, passing a concrete water tank at the foot of your descent. The E4 signs seem to have temporarily disappeared at this point of the walk. Turn right at the water tank and head to the road that you can see just below you. When you reach the road, turn left and walk into Lazanias, arriving there after 50 minutes. Lazanias is another very picturesque village and it’s worth taking a few minutes to explore the narrow streets and admire the old buildings. There is a cafe here, but it was closed when we visited. 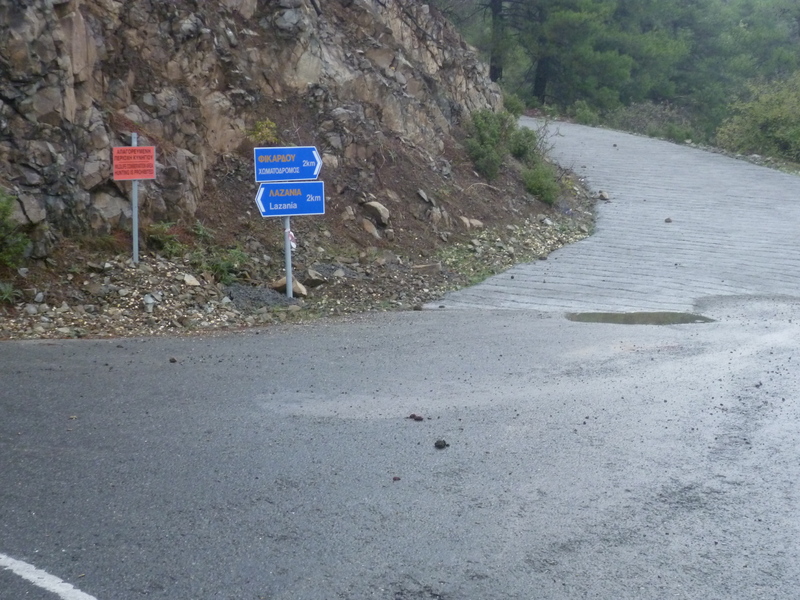 You will continue to follow the E4 through the streets of Lazanias towards Machairas. Look out for the signposts on walls and buildings – essentially you will walk down the main street and turn left out of the village. 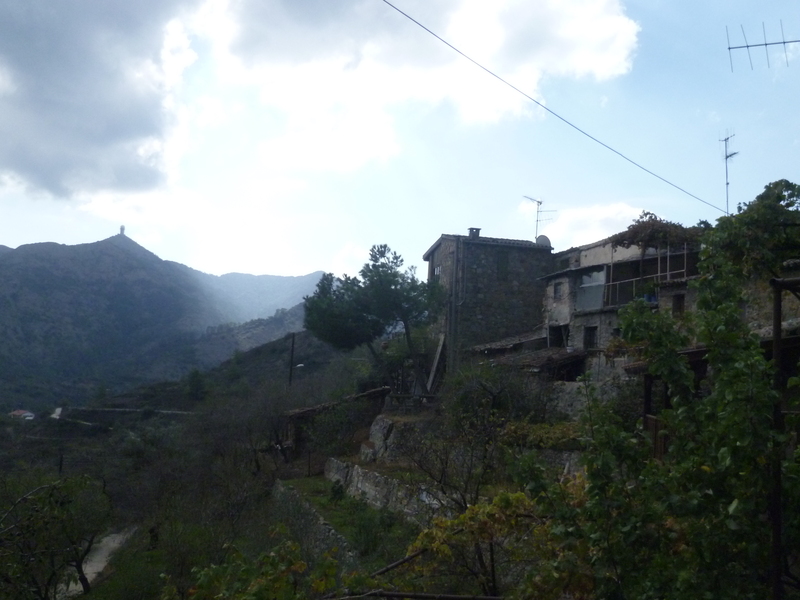 As you leave Lazanias you will be walking on a small road that skirts below and to the south of the village. In a very short time you will see two E4 signs, one on each side of the road. (See the photo below). LOOK CAREFULLY HERE! The sign on the right hand side suggests that the E4 continues along the road – it doesn’t – there is a footpath to your right which leaves the road and heads down toward the valley floor. And yes, we did miss it the first time around. So leave the road and follow the E4 footpath (1 hour) down into the valley. It’s a delightful path winding downwards through trees and shrubs which are full of small birds. We saw dozens of chaffinches, goldfinch, Cyprus wheatear, Cyprus warbler and numerous serin when we walked here in late October. The fact that this is an excellent location for small birds is sadly evidenced by the carpet of cartridge shells underfoot. And at 1 hour 12 minutes when you reach a concrete track, the E4 turns left, crosses the stream at a small concrete bridge, then turns immediately right, leaving the concrete road and back onto a grassy footpath. We had to negotiate a rather ramshackle low-level barrier at this point – presumably designed to keep vehicles off the footpath. A couple of minutes later you will reach a pair of concrete water reservoirs – your path climbs above and to the left of these. Keep following the path as it winds along close to the stream bed. At 1 hour 25 minutes you cross the stream bed (no problem when we did so – maybe a bit trickier after heavy rain) and start to climb the path as it zig zags up the other side of the valley. It’s quite steep in places and you will be glad to reach the road, and the end of your climb, at 1 hour 40 minutes. Turn left and walk along the road to reach the beautiful Machairas Monastery at 1 hour 45 minutes. The better known Kykkos Monastery is very impressive, but for a real sense of tranquility and somewhere completely at one with its surroundings give me Machairas any day. Actually – not any day. Mondays, Tuesdays and Thursdays between 9.00 a.m. and Noon if you want to see the inside of the monastery (although we visited on a Wednesday and, in typically Cypriot fashion, no-one seemed to care). If you haven’t dressed appropriately, don’t worry – the monks will lend you a dressing gown. The timings that follow take no account of any stop to look round the monastery and church at Machairas, so adjust them accordingly. 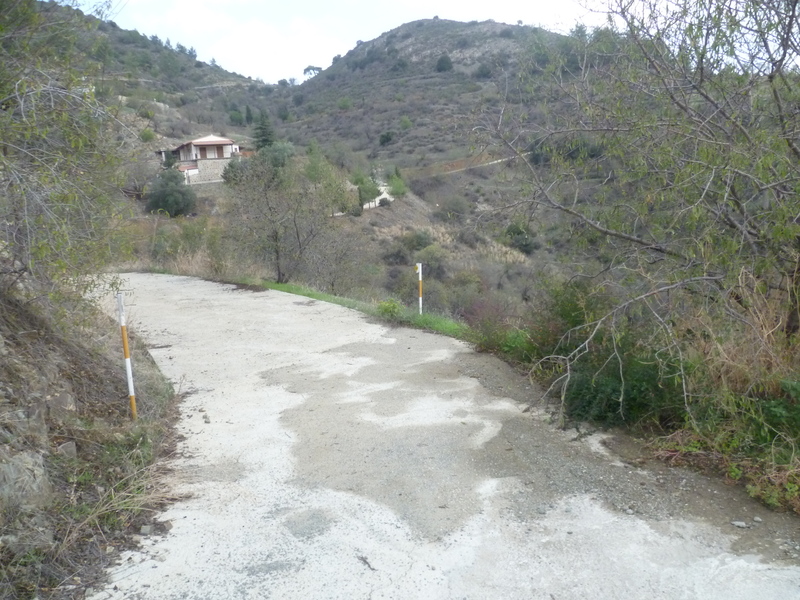 Leave Machairas Monastery and (very briefly) continue uphill along the quiet asphalt road towards Kionia. 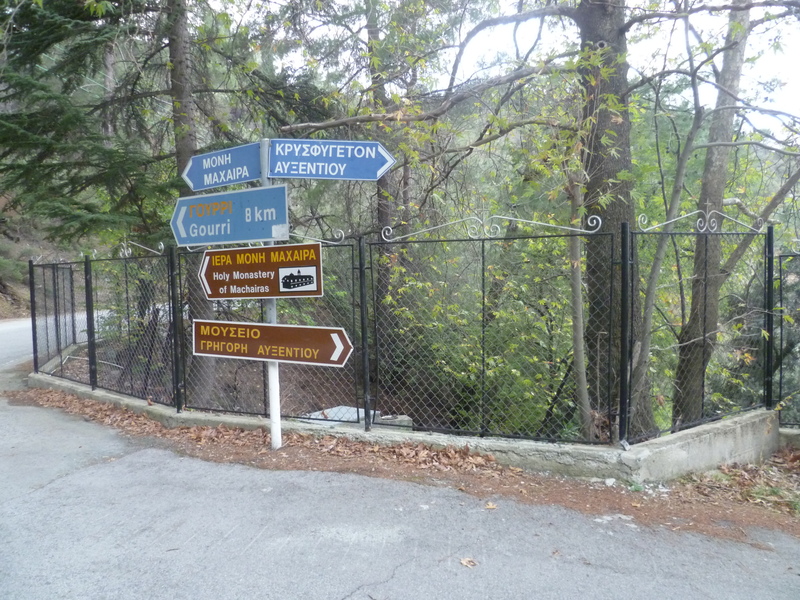 After no more than five minutes (2 hours) you will reach a left hand turn signposted to Grigori Axfentiou museum and also a nature trail: Machairas to Politiko. Leave the main road (and the E4) and head down this road with the monastery to your left. The museum is only open at weekends and so, in typical Cypriot fashion, cannot be viewed on the same day as the monastery! 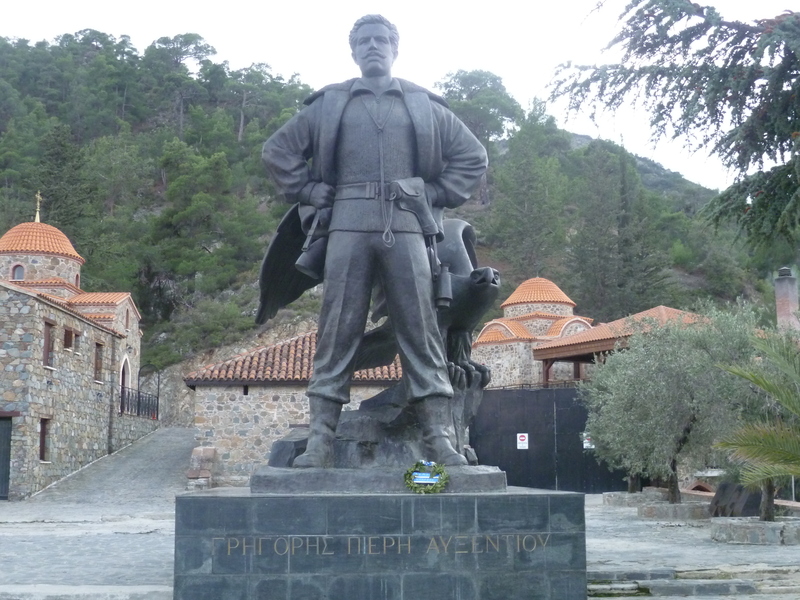 Nonetheless, there’s a rather impressive statue of the EOKA second-in-command and some impressive views northwards along the Macheiras valley and into the forest. Return to the road and turn left, continuing to walk away from the monastery in the direction of the Macheiras-Politiko nature trail. 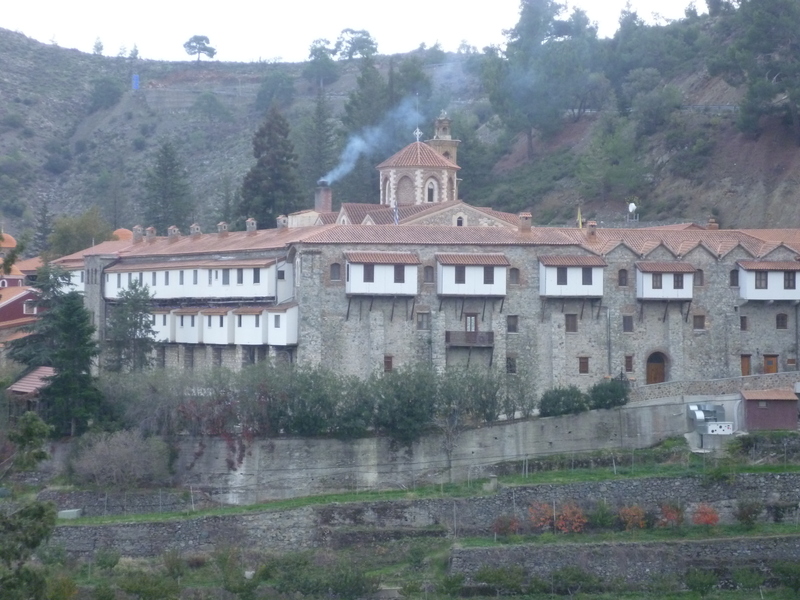 You will follow an asphalt road which skirts the side of the monastery and then heads down into the valley, passing a trail board and map (2 hours 20 minutes) before ending at a sign indicating Afxentiou’s hideout. 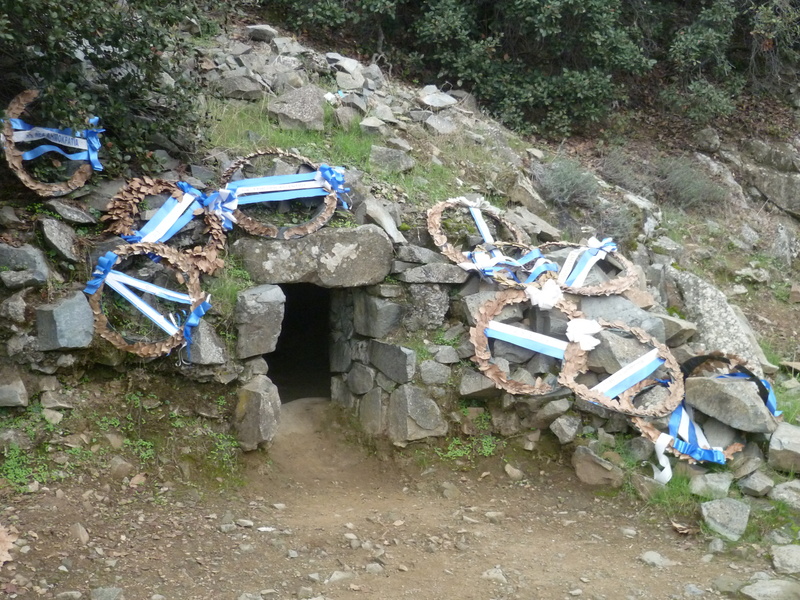 There’s a flight of stone steps which will take you down to the hideout which was also the place where Afxentiou died. The road ahead now becomes a clear earth track following the contours along the side of the valley. It is quiet, peaceful and rather beautiful. At approximately 2 hours 55 minutes you will reach a further trail board with a map of the local area. Our original aim at this point had been to continue along the earth track towards Politiko but, having spent a considerable amount of time looking around the villages, the monastery, the museum and the hideout we were becoming concerned that the distance would be too far given the shortness of the day in late October. 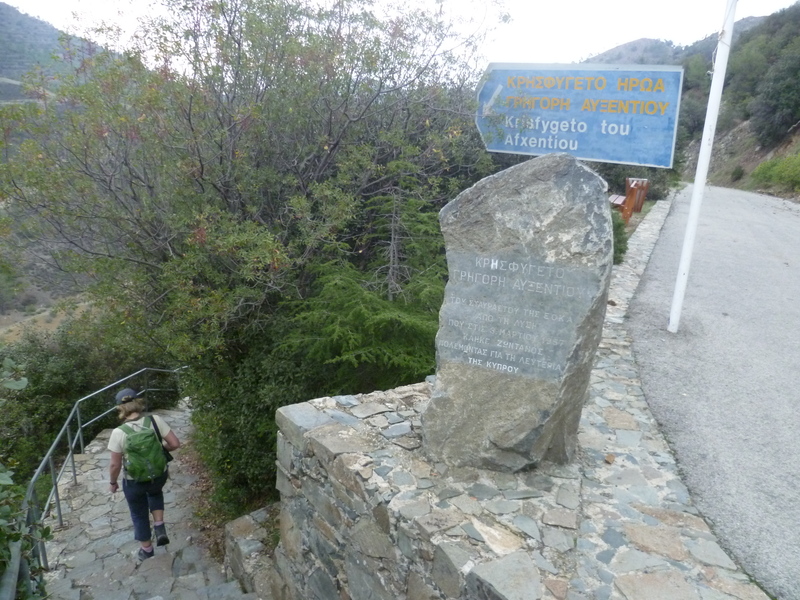 So we opted instead to leave the track and head down into the valley along the clearly designated “Nature Trail 5.3 km” which would shorten the circular route back to Fikardou. This turned out to be a happy decision for many reasons! So, at approximately 3 hours leave the earth track and head down into the Machairas valley along the nature trail, as indicated on the board. This is a delightful path, well signposted and apparently little used. It swiftly descends into a level trail which overlooks the river running through a rather impressive ravine below. 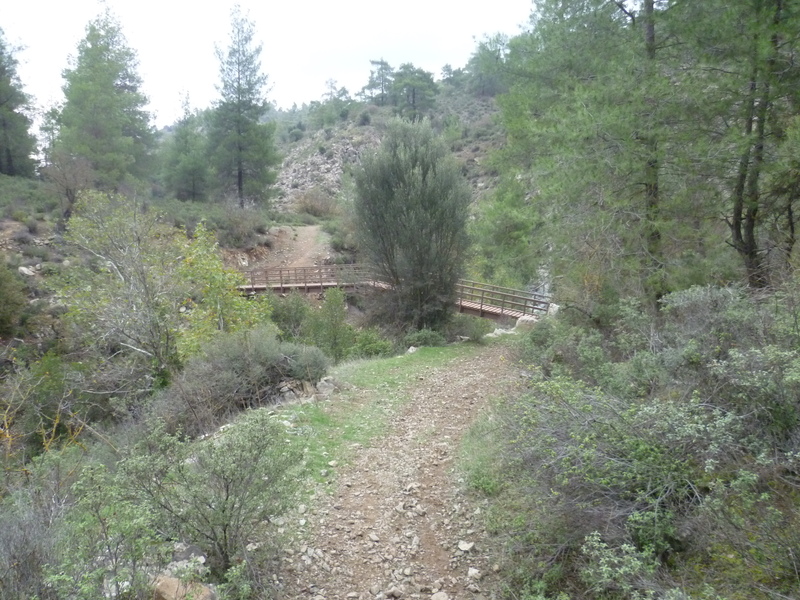 At 3 hours 10 minutes the path comes to a wooden bridge which crosses the river bed and takes you onto the other side of the valley. The path continues in the same vein on the other side of the river, with some very beautiful views along increasingly steep ravines. At this point we were taken unawares by a sudden and severe thunderstorm, turning a clear sky in a matter of a few minutes to dark clouds, light shower drops and then a blinding downpour of rain and hail. This swiftly reduced visibility to a few feet and turned the path into a flowing torrent of mud. Although we were wearing sturdy boots and carrying rain protection we were instantly drenched and, as lightning scarily forked down into the valley bed close by, we had little choice but to press on as swiftly as possible in search of proper shelter. We felt very exposed indeed. The storm remained overhead for well over an hour, during which time the rain and hail continued to sheet down unabated and lightning strikes lit up the valley around us. 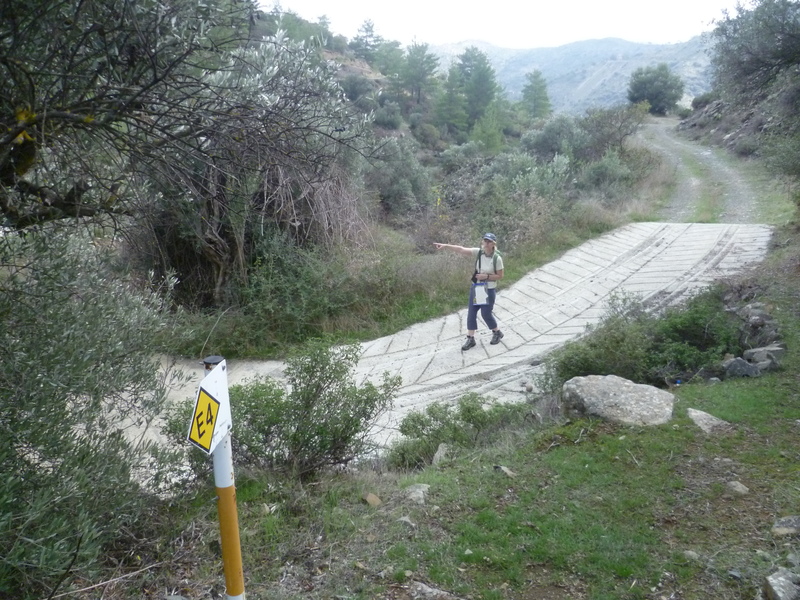 We slipped, scurried and ran through mud and flowing water, eventually following the nature trail up out of the valley and onto a small asphalt road which links Lazanias and Politiko. Here, we were fortunate indeed to find a large unused polytunnel by the side of the road and we gratefully hid inside until the rain ended. Timings are slightly haywire at this point but our best guess is that, from the point at which the bridge crosses the river bed, it is probably a further 30-40 minutes before the trail comes out on the asphalt road. Thus, you could expect to be by the wooden sign board at the end of the designated trail at approximately 3 hours 45 minutes. We intend to walk this beautiful area again in the future so will update this walk when we do. Our clothes were now soaked and our boots full of water. The rest of the walk, under clearing skies, was very much a squelchy affair. And because we had spent so long sheltering in the polytunnel, the late October day was already shortening. We needed to keep moving if we were to avoid walking in the dark. It all seemed a far cry from the early morning sunshine when we left Fikardou! 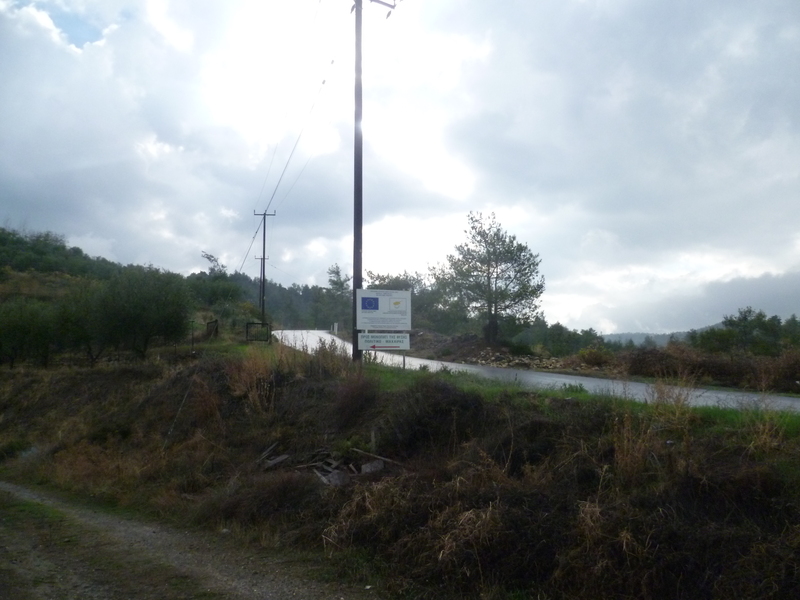 The asphalt road towards Lazanias was almost deserted – we saw only three or four vehicles in the space of almost an hour and a half. 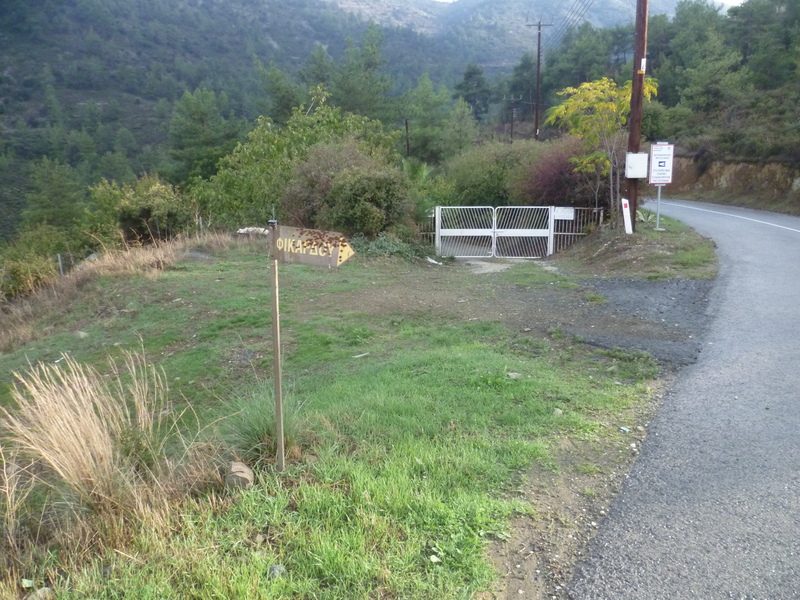 At around 4 hours we passed a signboard on the left of the road pointing to the church of Panagia Iamatikis – this looked of interest but…well, just not today! At 4 hours 10 minutes a small metal sign on the left indicated a right hand turn to Fikardou down an earth track. 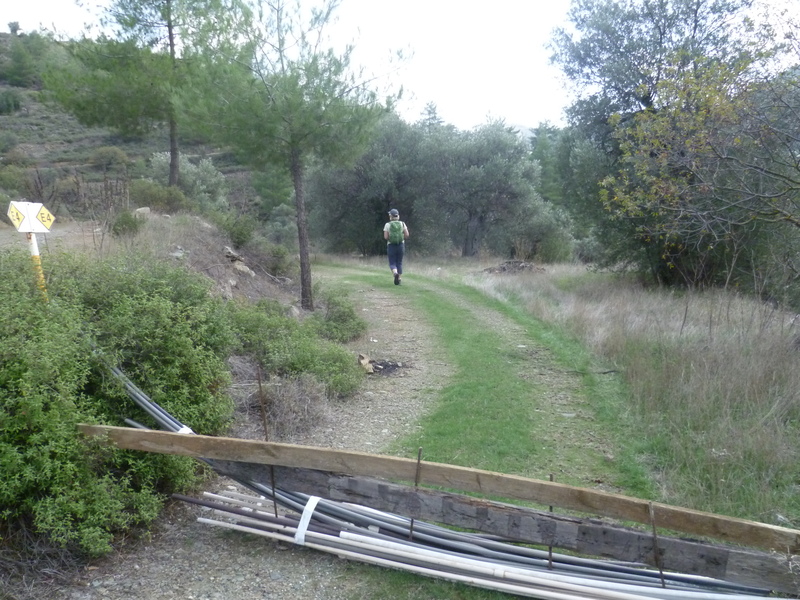 A clear track back to Fikardou without the need to go via Lazanias! More than this, it meant that we would probably be able to avoid walking in the dark! This is a clear earth road which winds around the side of the hill. Fikardou is soon visible below and it was a simple matter of a further 25 minutes or so walking to bring us back to the village. The path comes down into Fikardou behind the village restaurant and, as darkness began to fall, we were back at our car in approximately 5 hours 15 minutes of actual walking. The day itself had been considerably longer! The time from the bridge back to the road may be shorter. I’ll try to check if I can figure it out from my GPS program or time of photos.